With a heavy heart I must admit – we have conveniently forgotten, perhaps the greatest son of the soil and a true patriot. Much like the way we have long forgotten Bhagat Sing or Rajguru, we somehow managed to forget this chap also. It is an irony for our country and our countrymen that we tend to forget the true patriots with ease, all the while worshiping media projected and politically motivated entities, who otherwise wouldn't have stand a chance to be compared with these forgotten heroes. Not a single news channel (who calls themselves the mirror of the nation) had even a half an hour program to remember and celebrate the birth anniversary of Netaji Subash Bose yesterday. 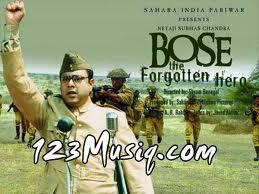 No Sangeet Sabha organized in Delhi to remember Bose. No Shradhanjali by our President or Prime-minister. No official message from our president to congratulate the nation on this day. It is pity to see news channels devoting more time to promote the latest Amir Khan-Kiran Rao movie than sparing a thought for this great man. Somebody correctly said – had he been one Subash Chandra Gandhi, then we would have been greeted with full front page memorabilia message in the morning news paper. But sadly he is one Bose not Gandhi. So who cares for a certain Bose, Sing or Azad and their contribution in nation building as long as they don't carry that Gandhi surname? Original or borrowed doesn't matter – all that matters is the surname itself and period. I have no personal differences with anyone or any family but the open hypocrisy and prejudiced behavior of an entire nation promptly hijacked by a bunch of paid media houses and buttering crooks is what bothers me a lot. In the process of projecting few handful entities as the architects of modern India and picturing them with larger than life image for personal and political gains, we just can't and we shouldn't forget and ignore greats like Bose or Bhagat Sing. I get a feeling that – somehow the Congress and its so called leadership always wanted the nation to forget a great like Bose. While the reasons of such a bizarre wish are quite unknown, the motive is somewhat not. Look at the dilemma and jingoisms of our Defense Ministry. When our Defense Ministry had to fight out violently in courts against an RTI filed to make the Manuscript of Netaji public, is outrageous. It is criminal for depriving the citizens to know about the person which the nation loves so much. The funny reasons given that the government is in the process to publish the manuscript in the form of a book and the early leak of the details might hamper the economics of the whole effort are again outrageous. When the manuscript was handed over some half a century back and still the government is in the process of publishing it, leaves no scope of speculation that the said stuff won't be published in our lifetime at least. And what is that economics nonsense? Are we going to calculate how many copies of the so called to be published book in 2080 we are going to sell? Or is it how much money we are going to garner by letting know the populace about their most beloved son? Mr. A.K Antony - let me assure you. None here is a kid and a bit of info if you care to consider – we have long done away with the affinity for lollipops. The whole idea of shielding the masses from the truth about Bose has got more to do with the ideology and principle that Bose always lived for and died for. While Bose is still a hero and would remain one in the hearts of millions of Indians, he would always remain a threat towards the image of the Congress in general and few easterly stalwarts of the party in particular. Netaji always considered himself an extremist with pious intentions and this particular self belief is what doesn't go down very well with the ideologies of Gandhi and Nehru upon which the party was founded. The announcement of Nehru in 1942 that they have parted away with Subash Bose for his extremist attitude has gone a long way in motivating the Congress to shield Bose from the rest of India. While Bose is too big a figure to ignore, the Congress still can't admit it openly as it would go against what Nehru said back in 1942. If that happens then probably the Party would openly accept the fact that Bose was always a better statesman and visionary than Nehru and few other greats of that time put together. This would not only be a dent in the well preserved image of Nehru but also on the party. So Bose can go for a walk as the truth has too big a price tag to afford. Don't consider me being nasty in this comparison as I have got nothing to do with anyone's origin. While the Congress was always critical about the German wife of Netaji they promptly surrendered and seem at comfort and ease to be accepting the Italian wife of another leader. Either this is plain hypocrisy or am I missing something? Perhaps the know-all Manish Tiwari can throw some light on this. Having said that – The Congress doesn't want to fully disown Bose. Or else what can explain the presence of a small photo of Bose in Congress Banners? Even if his photo appears in the smallest form and that too after greats like Rajeev Gandhi, it gives us a feeling that even though the Congress is not admittedly confident on adoring Bose in great way they didn't want this great leader be used by any opposition party either. Bose is a phenomenon who seems to be everywhere yet being nowhere. BJP can blow the trumpet that Bose is their man as it is none other than Savarkar who used to guide Bose a big way. The Marxist can have their pair of trumpets and furnish their claims of Bose being their looking at the close association of Bose with big Marxist leaders like Mussolini. And of course Congress can always do so as Bose is the first person who called a certain Mohandas Karamchand Gandhi as the Father Of the Nation. But irony – while all seems to lay their claim, none ready to admit. So at the end of the day "Bose Babu" is allowed to be forgotten year after year and the memory of this great man is getting thinner and thinner. Thanks to Orissa and West Bengal governments who proudly have announced Netaji's Birth Anniversary as a state holiday and celebrate with the vigor and interest which Bose deserves more than anyone. Thanks to Baba Ramdev for his gesture where he organized a mass rally in Cuttack, the birth town of Netaji and did a padyatra with thousands of citizens to the birth place of Bose and paid homage to this rapidly forgotten hero and perhaps the biggest patriot we would ever see. I would agree that Netaji did not deserve this ignoring, but so did Sardar and Rajaji. They did not even have issues like Netaji had. Netaji's hitching the wagon to Hitler's side reflected his confusion about ends and means. Even seeking this end, it was a horrible game plan. Netaji crossed swords with Sardar in Sardar's family matters. He did treat Sardar's brother Vitthalbhai in his illness in Eurpoe, but Vitthalbhai's last minute changed will endowed his assets to Netaji and Vitthalbhai's nieces and nephews with specifically inserted exception - Maniben. This will was thrown out as forged by court. He won election against Gandhi's candidate, but could win hearts. He could not /did not form the governing committee after winning and before resigning.